In this three-part series, I will be examining the relationship between the architect Frank Lloyd Wright and his mentor Louis Sullivan, specifically in the controversy surrounding one of the most important designs in early modern architecture: the James Charnley House, constructed between 1891-92, in Chicago’s Gold Coast. Although Adler & Sullivan were the architects of record at the time of construction, since the 1930s Frank Lloyd Wright has been routinely listed alongside them (or sometimes alone) since he wrote in An Autobiography in 1932 that he solely designed the home. No one challenged this assertion, especially Adler & Sullivan, as both were long dead by the time Wright’s memoir was published. Although the commission was widely published in architectural journals of the time, like the August 1891 issue of Inland Architect and the January 1892 issue of Architectural Record as one of Sullivan’s most important works, Sullivan’s name was mostly omitted from discussions of the Charnley House for the next half century. Even Hugh Sullivan’s 1935 monograph on Louis Sullivan, the first detailed assessment of the architect’s work, validated Wright’s claims first made in An Autobiography. No sketches, no plans, no furnished interior photos survive of the home. Because of this lack of concrete contemporary evidence and the fact that scholars never conducted a detailed investigation over the years, one can see how easy it was for Wright to claim this ground-breaking design as his own. In Part 1 of “Louis Sullivan, Frank Lloyd Wright, and the Charnley House” I discussed not only the controversy surrounding the home’s authorship but also both Sullivan and Wright’s architectural output during the years leading up to (and after) the home’s design. 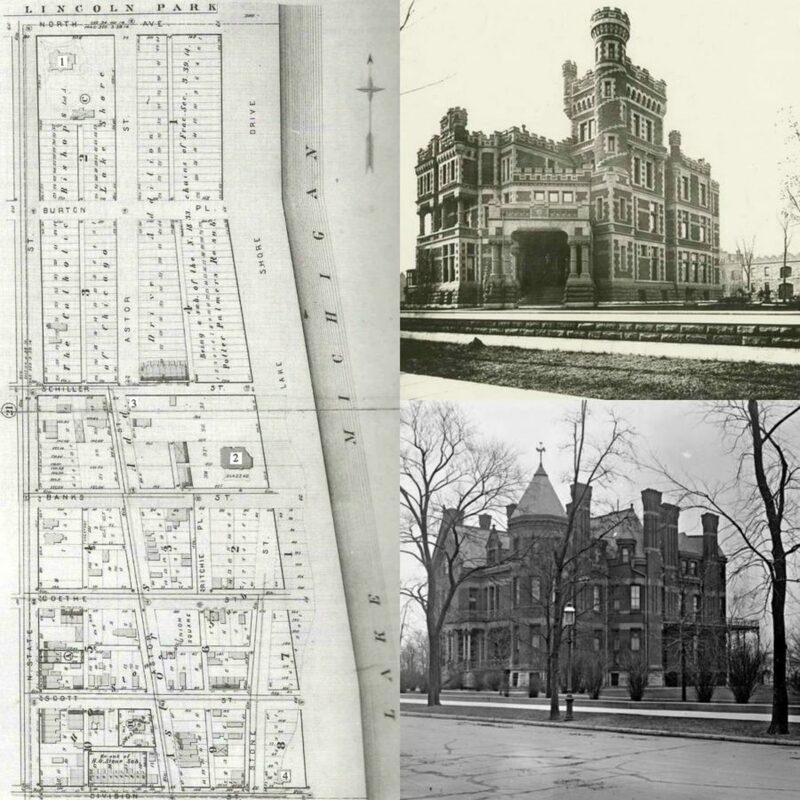 Between 1887-1890, Sullivan’s experimental period of creating buildings focused solely on surface and mass led to the development of his own personal style, while Wright’s work throughout the 1890s exhibited a number of features similar to his first employer Joseph Lyman Silsbee and historical revival designs. Although residential, Charnley fits in perfectly with the evolution of Sullivan’s architecture at the time. It was only after working for Sullivan that Wright’s architecture resembled the geometric clarity evident in Charnley, which will be discussed in Part 3 with an examination of the Winslow House. I also raised valid points in Part 1 related to Sullivan and Wright’s practice of organic architecture, specifically the initial sketch or “esquisse,” as well as the home’s possible connection to California modernist architect Irving Gill. This section will take a closer look at the misconceptions surrounding Sullivan’s residential designs as well as what exactly Wright worked on while employed for Adler & Sullivan, then explore the history and development of the Gold Coast neighborhood, followed by an examination of the Charnley family and their other residences before moving on to the house itself. Sullivan and Wright: Who Did What? Before we look at the Charnley family and their famous house, let’s address one of the more popular misconceptions about Louis Sullivan. Besides Wright’s claims of solely designing Charnley in An Autobiography in 1932, Wright also declared in 1949’s Genius and the Mobocracy that “I designed the Charnley townhouse on Astor Street” because of the firm’s “refusal” to build residences. This statement was followed by 1954’s The Natural House in which Wright wrote “the firm [Adler & Sullivan] did not build residences,” especially after the Auditorium was erected in 1889. Is this true? Well, to a certain extent – but for anyone who has studied Wright, it is a well-known fact the architect continually made deceptive and self-serving statements throughout his 70-year career. Also, Wright’s rather inflated portrait of himself has been accepted as fact, instead of questioned, mainly because he lived long enough to “sell” his version of events. During their partnership, Adler and Sullivan designed almost 200 buildings between 1880 and 1895. Before Wright joined the firm in 1888, nearly 60 residences, more than any other building type, were built. After the success of the Auditorium, the firm might not have forcefully sought out residential buildings but they did continue to design them (although the majority of them were unbuilt); 13 to be exact, or 2 a year. Not known to delegate responsibilities, Sullivan usually kept a close eye on his young staff, even when it came to residential work. 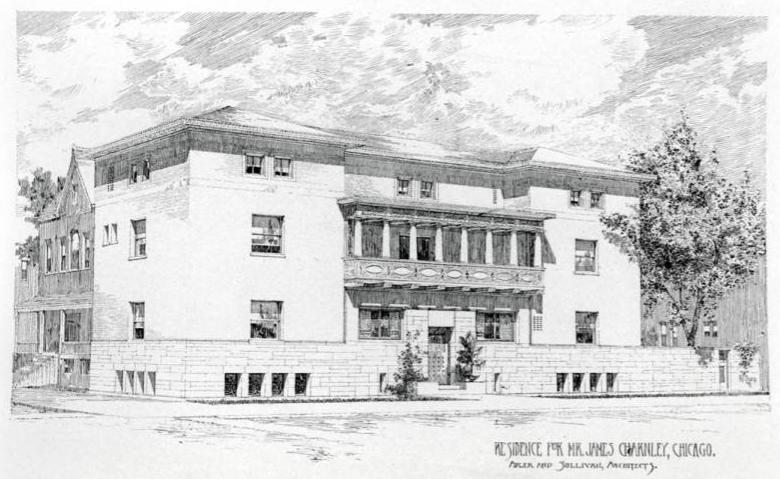 Sullivan even continued to procure domestic commissions after he dissolved his business relationship with Adler, and a number of the designs, including the Henry Babson House (1907) in Riverside, Illinois and the Harold Bradley House (1909) in Madison, Wisconsin, continued the design principles first established at the Charnley House. I’ll go into more detail on those homes in the third part of the article. 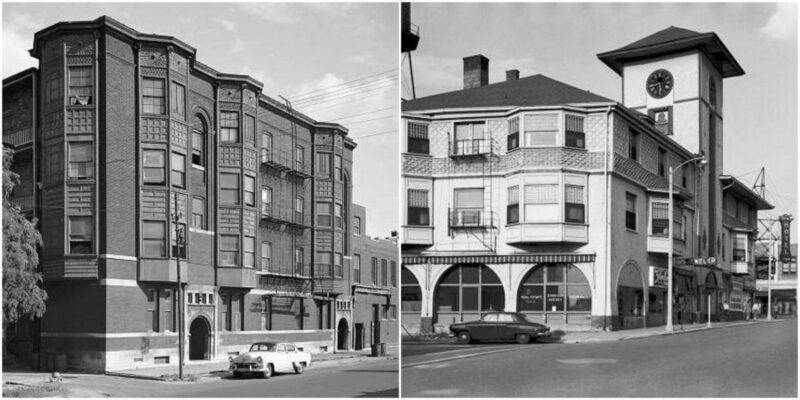 Because of urban renewal in the 1950s and 60s, the majority of Adler & Sullivan’s buildings were demolished leaving little evidence of the great number of residences they actually produced over their career. 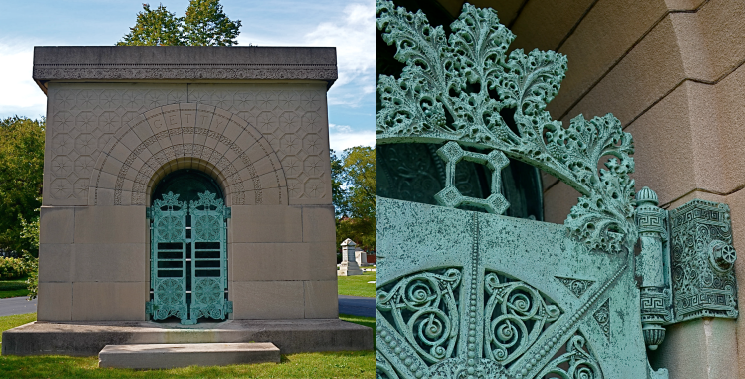 Not including the six structures attributed to Sullivan during his independent career (as well as the two tombs in Graceland Cemetery), only thirteen Adler & Sullivan-designed buildings still stand in the city of Chicago. Yet each surviving building is important in telling a story and giving a better understanding into the different phases of their work. While the firm did not have as many domestic commissions as they did before the Auditorium, Wright makes it sound like Adler & Sullivan had no experience at all in residential design, and that once he joined the firm only he could have created them. Although the evidence does not support Wright’s declarations, let’s not forget there were other very capable draftsmen who worked for Adler & Sullivan during the same time period, like Irving Gill (discussed in Part 1) and George Elmslie, who both could have helped with domestic commissions. But Wright’s ego would never allow him to admit such a fact. Sullivan and Wright’s working relationship cannot be discussed without mentioning another equally important player in Sullivan’s life, and that would be George Elmslie. Like Wright and Gill, Elmslie trained under Joseph Lyman Silsbee, before moving to the offices of Adler & Sullivan, supposedly on Wright’s recommendation. Two years younger than Wright, Elmslie was described in Wright’s An Autobiography as a “slow thinking, but refined Scottish lad who has never been young” while Elmslie’s architectural partner William Purcell said the exact opposite of Elmslie: “a man of quick imagination; his mind in architecture was highly articulate, succinct and competent.” Despite claims made by some historians and even by the architect himself, Wright was never chief draftsman in the Adler & Sullivan firm. 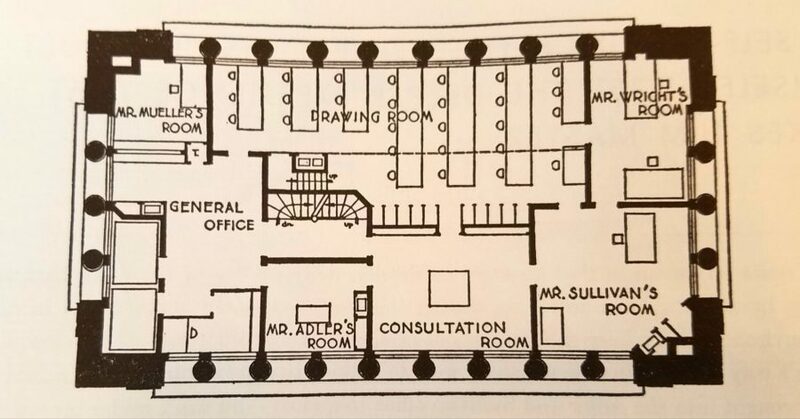 Instead of having his own private office, Wright actually shared a small room with Elmslie. As mentioned in Part 1, Sullivan’s development as an architect was due to a personal evolution of surface and mass experimentation, which had more to do with H.H. Richardson than the influence of Wright. Elmslie later admitted both of them worked for Sullivan at the height of the architect’s creative powers: “Sullivan did not, of course, need Wright; while the latter has emphasized in glowing terms the benefit he received in communion with his master.” While Wright may have embellished his power in the Adler & Sullivan firm, calling himself “the pencil” in Sullivan’s hand, when Sullivan was later an independent architect and struggling with a lifelong alcohol dependency, it was Elmslie who had more responsibility in the design and production of Sullivan’s work from 1895 until 1909. Yet there is a difference. Unlike Wright, Elmslie did not declare every single Sullivan commission as his own. Elmslie even suggested Hugh Morrison’s 1935 monograph on Sullivan “attributes a bit too much” to him. While Elmslie had made a number of changes to the National Farmers’ Bank in Owatonna (Wright called it “one of [Sullivan’s] master works” as well as “a high wall with a hole in it”), he asserted other works, like the Bradley House, as “wholly Sullivan’s”. Elmslie was also quick to correct Wright, who had asserted the Schlesinger and Mayer Store (1899) as his own design, although he was no longer Sullivan’s employee during this period. Yet such a preposterous statement fits with Wright’s character, who at various times also claimed credit for Adler & Sullivan’s Auditorium (the project was designed two years before he joined the firm), Wainwright Building, and Chicago Stock Exchange. In correspondence between the two architects during the 1930s, Elmslie accused Wright of being “damnably egocentric” and “untrue” and “greedy for a posthumous honor” in An Autobiography, and reminded Wright “how often I went to Oak Park to do a bit of drawing for you” (like the Roloson Rowhouses on Chicago’s South Side). Elsmlie even suggested “I think I know the real Sullivan better than you do or anyone else. I saw him in his intellectual prime. You saw none of his in those years.” We’ll never know which architect was the closest to Sullivan, yet it is worth noting Elmslie was named executor of Sullivan’s estate in his will. Unfortunately Elmslie threw out Sullivan’s diary after his death – “who wants to read that old stuff” – leaving Wright and Elmslie voices that much stronger in the story of Sullivan’s life and career. While Frank Lloyd Wright asserted he solely designed some of Adler & Sullivan’s work in An Autobiography, George Elmslie recalled in the 1940s that Sullivan always saw drawings of works in progress, including the Charnley House. As discussed in Part 1, the esquisse was important in Sullivan’s architecture and Elmslie confirms it with his statement. Wright would never have been left on his own as Sullivan was known to always supervise his draftsmen. But it is not difficult to see why an egocentric like Wright thought he was the one “inventing” these buildings rather than “interpreting” or “translating” the ideas coming from the chief architect and designer. Wright’s claims of “doing” a building – working on nights and weekends – is not the same as actually “creating” a building; it’s just well-established architectural verbage used when one prepares drawings. While Elmslie understood the difference between the two, Wright did not. If Wright did not design Charnley House as he claimed, then what Adler & Sullivan buildings might he actually have contributed creatively? Backed up by Elmslie’s recollections of the structures as being “more Wright than Sullivan,” most historians believe Wright had more freedom in the creations of not the Charnley House, but the Loeb Apartments and the Victoria Hotel. Built at the same time as Charnley, the Loeb Apartments was located in an area full of manufacturing plants and storage facilities on what is now the northeast corner of Randolph and Elizabeth Streets on Chicago’s Near West Side. It was not a prominent commission, and that might have been the reason Sullivan gave his 24-year-old draftsman more leeway in its design. With the exception of Sullivanesque touches in the ornament in the window bays and arched entries, the stone and brick building is a rather unexceptional and somewhat awkward design. In 1957 Wright would even admit, although a bit reluctantly, to preservationist Richard Nickel that he designed the building. After Sullivan’s death, Wright was quick to claim Charnley but it took sixty-five years to acknowledge a less progressive design. 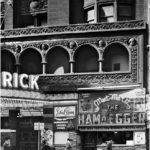 Part of the building was demolished for the widening of Randolph Street in 1923, with the rest to follow in 1974. In regards to the Victoria Hotel, Elmslie remembered Wright “worked on it a lot” with another draftsman at the firm, Louis Claude. The hotel certainly resembles Wright’s early work as an independent architect with its horizontal brick facade and hipped roof with overhanging eaves. Wright left the firm just as the building was nearing completion, and the next year in 1894 “copied” the Victoria Hotel’s use of projecting horizontal friezes of plaster ornamentation in Winslow House, which will be discussed in Part 3. Located in suburban Chicago Heights, the hotel and its storefronts were modified over the years and just before its scheduled demolition in 1961, the building was destroyed by fire. It is interesting to note that James and Helen Charnley were just as unique as their landmark home; not only were they pioneers in the development of modern architecture but also in the frog-infested swamp that we now call the Gold Coast. After the Great Chicago Fire of 1871, the buildings located on the land owned by the Roman Catholic Church (the parcel went from Lake Michigan to State Street and Schiller Street to North Avenue) completely burned down and many North Siders fled to other parts of the city than rebuild. This tract of land was so empty (it was described by the Chicago Tribune in 1882 as “virgin ground…almost entirely free from objectionable buildings”) that a local toboggan club used it for outdoor activities. But in the 1880s developer Potter Palmer soon transformed the area with landfill, then convinced the city to build a seawall, just north of Bellevue Place, as well as create a relatively quiet boulevard, Lake Shore Drive, adjacent to his forty-two room mansion that was to be used for carriage rides up to Lincoln Park. Not only would these improvements enhance his property values but hopefully attract other affluent families to relocate here from Prairie Avenue and the South Side. An early resident, Louise de Koven Bowen, remembered Astor Street in 1890 as having “only three or four houses…that had just been redeemed from the beach…[and] digging the foundations of our house, workmen found numerous bones.” Yes, that’s right – the Gold Coast used to be a graveyard. 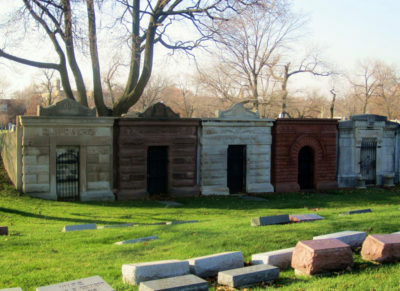 The public Chicago City Cemetery was located in what is now the southern part of Lincoln Park, but the old Catholic Cemetery stretched along Astor Street until the 1860s. But that’s a whole other story! While Palmer’s “flagship mansion” was under construction from 1882-85, the Charnleys were the first wealthy family to actually move to the area that became the Gold Coast. 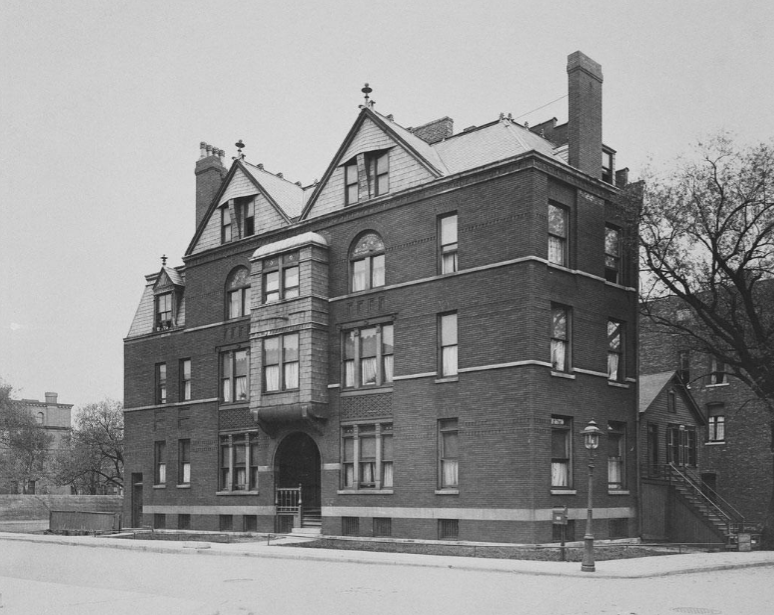 A decade before they commissioned Adler & Sullivan to build a home at the corner of Astor and Schiller Streets, the Charnleys first lived in a design by the architects Burnham & Root on Division Street and Lake Shore Drive. Another Burnham & Root design, the Montauk Block, is where Charnley listed his office so this might have been the connection between the client and the upcoming firm. 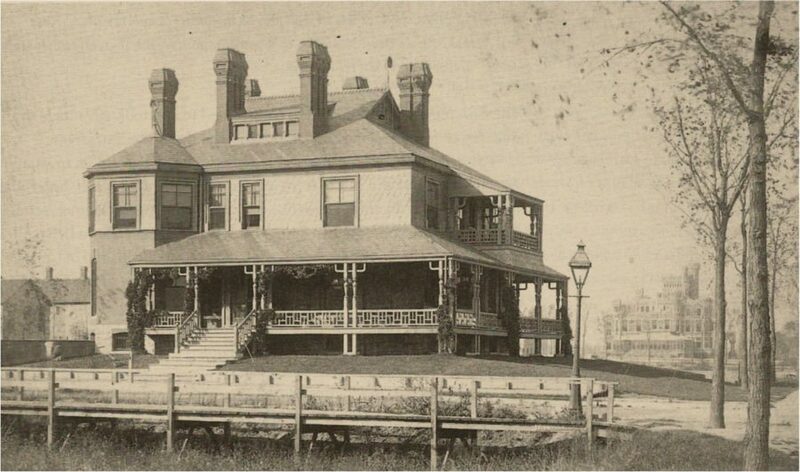 The first Charnley home was completed in 1882, three years before “Palmer’s Castle” was ready for occupancy. Believe it or not, Charnley’s home (if you do not include the unfinished Palmer mansion as well as the Cardinal’s mansion, under construction from 1881 through 1885) was the only lakefront building standing along Lake Shore Drive between Oak Street and Lincoln Park at the time. But that would soon change. Although Root had designed their first home as a reflection of its surroundings, “a country home” with open porches, it was quickly encircled by nearly 25 mansions in the next decade. In 1912 the residence was torn down for a luxury apartment by Marshall & Fox. In 30 short years the neighborhood had been transformed from an open marsh to an urban environment. As the neighborhood changed dramatically in a short amount of time, the Gold Coast’s first apartment building, constructed in 1886, was actually designed by Adler & Sullivan, five years before their Charnley commission. 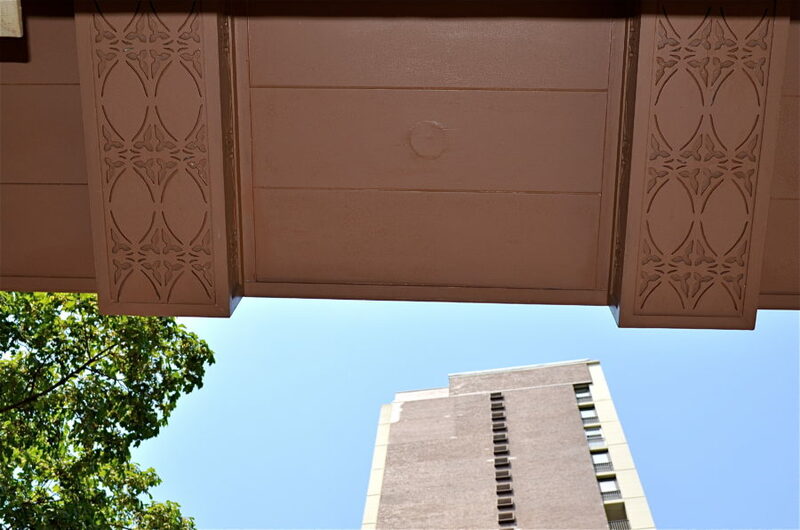 The Edward G. Pauling Apartments was built on the 1200 block of Astor Street, a prime example of how the area rapidly transformed from an undeveloped piece of land to a bustling neighborhood just as Potter Palmer had hoped. In 1913, less than twenty years after it was constructed, the rather narrow, three-story building was demolished for a larger apartment complex, yet another victim of the area’s ever-changing growth. 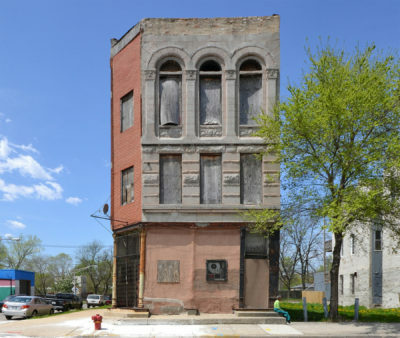 In examining the authorship of the Charnley House it is worth noting the close relationship that existed between Louis Sullivan and the Charnleys. This wasn’t just some unimportant commission. Even if Wright was correct in his declaration that “Sullivan did not design houses” after he joined the firm, the Charnley House was a very special case. 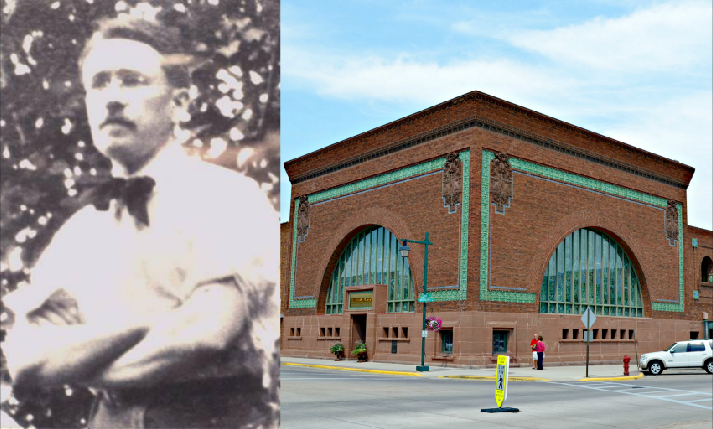 While most of Adler and Sullivan’s business came through Adler’s connections, especially within the Jewish community on Chicago’s South Side, the Charnleys were personal friends of Sullivan, probably first meeting through their association with the Illinois Central Railroad. 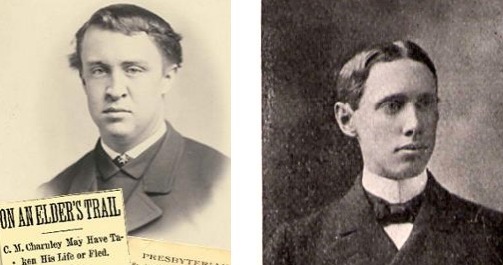 Sullivan’s brother Albert was an executive, later becoming general superintendent by the late 1880s, while Helen Charnley’s father served as the fifth (and later the eighth) President of the company. Known for its aggressive real estate development, in which it promoted communities as winter resorts for Midwesterners, especially along the Gulf of Mexico, Illinois Central was the connection that led the Charnleys and Sullivan to work together, not once but twice. Wright would also claim (later to be rejected by most scholars) to be the architect of these vacation cottages, which is hard to believe, especially when one of the homes was to be used by Louis Sullivan himself. Wright never even visited the site, a beautifully natural setting of oak, hickory, and pine trees that served as inspiration for Sullivan. In Autobiography of An Idea, Sullivan wrote that after designing the “two shacks” in March of 1890 the prepared plans were given to a local carpenter to construct. Sullivan personally landscaped the grounds to include two rose gardens, arranged in concentric circles. 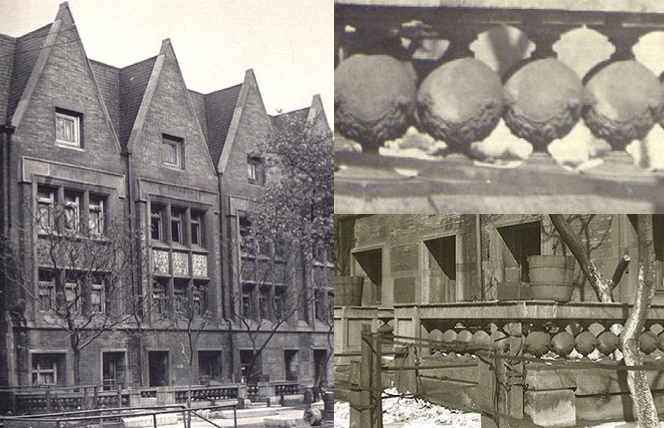 Photos of the house were published in Architectural Record in 1905, accompanied by an essay not by Frank Lloyd Wright but by Lyndon P. Smith, Sullivan’s associate on the Bayard Building in New York (1899). Sullivan lived here for the next eighteen years, staying for months at a time as his career slowed down. Unfortunately Sullivan’s beloved cottage was completely destroyed by Hurricane Katrina in 2005, but the Charnleys’ home has been rebuilt and is now open to the public. Although listed in the Chicago Blue Book, James Charnley, a partner in the prosperous Bradner, Charnley, and Company, was not your typical wealthy gentleman. There is evidence that shows the lumber merchant belonged to the Chicago Literary Club, but he was not associated with any other clubs nor anything related to the World’s Columbian Exposition of 1893, very unusual as it was Chicago’s most important social event at the time. Not a single photograph has been found of him. It is also worth noting that Helen Charnley, like her husband, was not as socially active as other ladies of the day and it is believed she did not belong to a single social organization. Yet their reputation for being extremely private is somewhat contradictory. In 1899 the Chicago Tribune listed her as a participant in a Christmas charity dance. 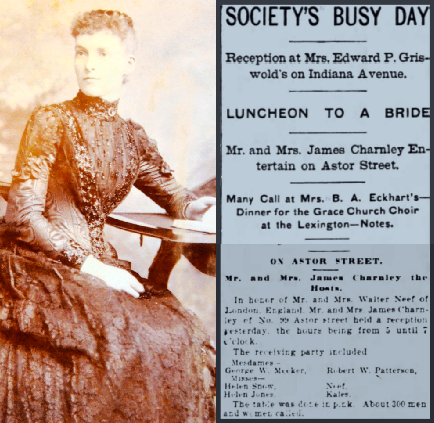 The Chicago Inter Ocean, a newspaper published from 1872 to 1914, had a society article in which 300 guests attended a reception at the Charnley home in 1896. It was not until recently that a few photos of Mrs. Charnley were found – one dating from before the house was built and another taken long after she moved away from Chicago. There are two possible explanations for the family’s unusually private nature. Only a year after moving into their Burnham & Root home, the Charnleys lost their two young daughters, 6-year-old Helen and 4-year-old Bettie, to diptheria within a week of each other in early 1883. 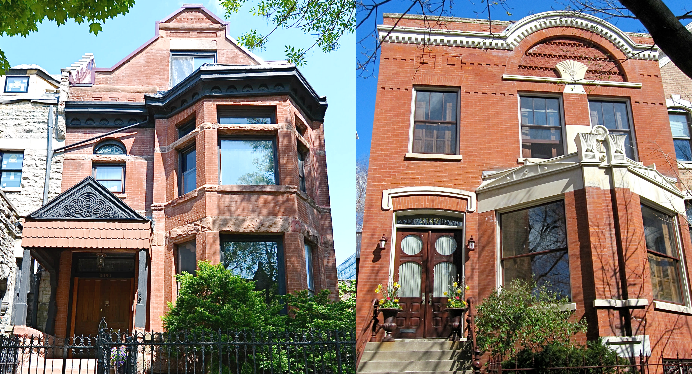 Another reason might be attributed to James Charnley’s brother, Charles M. Charnley Sr., who lived around the corner in the eastern-most townhome of the Olof Ostrom Rowhouses, built in the 1880s, on Schiller Street. The brothers were in the lumber business together, but some bad investments left Charles broke and he was forced to move in with his brother for a short period of time. In 1897 Charles embezzled $100,000 (about $2.7 million in today’s money) from the Fourth Presbyterian Church, in which he was a church elder, and disappeared. His wife followed him a few days later. Detectives tried to find him but couldn’t trace his whereabouts. Due to embarrassment and disgrace, two of his sons committed suicide. Under an assumed name, 21-year-old James Jr. killed himself with a revolver after taking a deadly dose of morphine in a room at Milwaukee’s Pfister Hotel in November 1897. His cousin Douglas Charnley had to identify the body. A little over six months later in June 1898, 24-year-old Charles Jr. followed his brother as he put a bullet through his head at Peniel Hall in Los Angeles. 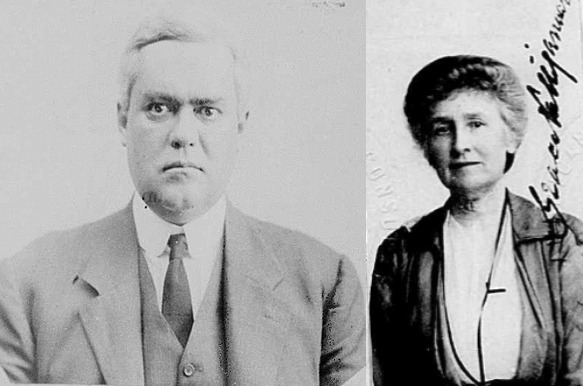 Although it was believed the father completely vanished, Jack Perry Brown, former director of The Ryerson and Burnham Libraries, discovered that he fled to Canada under a pseudonym, along with his wife. They eventually settled in the American South, where he was buried under his assumed name. The majority of his family were unaware of his whereabouts, although he was in contact with some members of the secret society “Skull & Bones”. Long after the Charnley House was built, Frank Lloyd Wright proclaimed it to be the first modern house in America. No other house in the United States was like Charnley in its total abstraction, its scarcity of ornament (limited to specific areas in the balcony, cornice, and window grilles), and its manipulation of composition and scale. 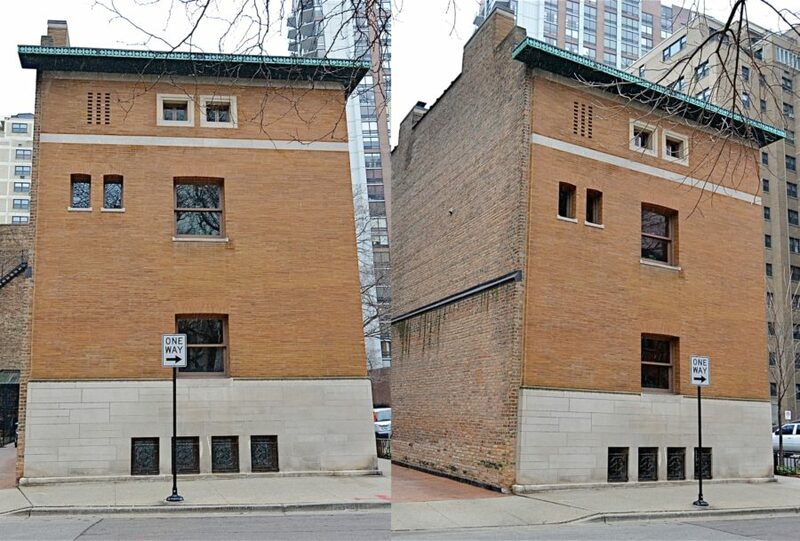 Built to the edges of a shallow 25 ft deep lot, the Charnley House appears to be a freestanding mansion with three finished exterior facades and one wall left blank in anticipation of an attached neighbor to the back. James Charnley had sold the adjacent lot directly to the east before he ever commissioned Adler and Sullivan to design the house; therefore the architects had to erect a party wall, and the only possible solution to bring extra light into a home with no back windows was to create a 30 ft high light atrium in the middle of the building. But let’s not get ahead of ourselves. Before the discussion of the home’s amazing interior, which will be discussed in Part 3, its equally unconventional facade must be thoroughly examined. 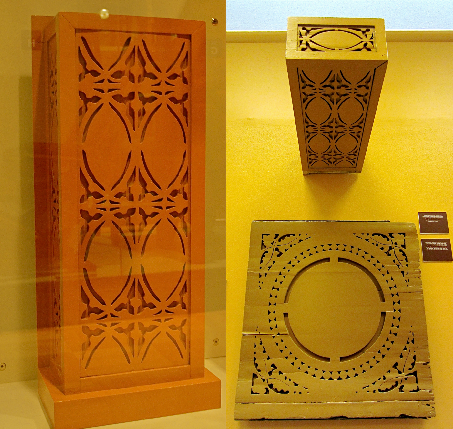 As we explored in Part 1, during the time of the Charnley House design, Louis Sullivan was attempting to create a “new architecture” that focused on surface and mass in an evolutionary process in which more and more of his designs were becoming “cubist-like”. Charnley was no exception. The irony of the home’s design is that although vertical on the inside, its exterior is purely horizontal with its smooth-faced limestone base, anchoring it to the ground; the expanse of the long Roman brick in the middle; and the thin copper cornice at the top. The home can be divided into unequal thirds, with the base acting as “a grand plinth” that supports the central section, including the beams of the balcony. 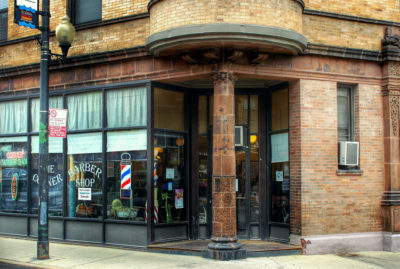 This idea of creating visibly divided three “zones” of design was also evident in Sullivan’s tall commercial buildings, which usually had a plain base for ground-level shops; then the main office block with vertical masonry ribbons rising unimpeded to emphasize the building’s height; and an ornamented cornice at the roof level. A hierarchical composition visually separates the parts but ultimately achieves a balanced whole. On the basis of the exterior, it is hard to believe Wright alone could have created such a modern-looking facade, especially when one compares its similarities to Sullivan’s experimentation in geometric simplification and commercial building design arrangement. Charnley’s self-disciplined design does not stand up in comparison to 24-year-old Wright’s “bootleg” homes of the same year, mentioned in Part 1. The home’s main western facade is completely symmetrical, not something Wright was known to do as an architect, while the open second floor balcony/loggia is just like the one at Adler & Sullivan’s Auditorium. Although an unadorned cube mass, the small amount of exterior ornamentation, specifically the balcony, resembles Sullivan’s designs at the time. The low-pitched hip roof and Roman brick veneer could have come from Wright, who preferred the roof type in his residential designs (although not until 1897) and was producing his “bootleg” homes, like Harlan and MacHarg, with the same material. 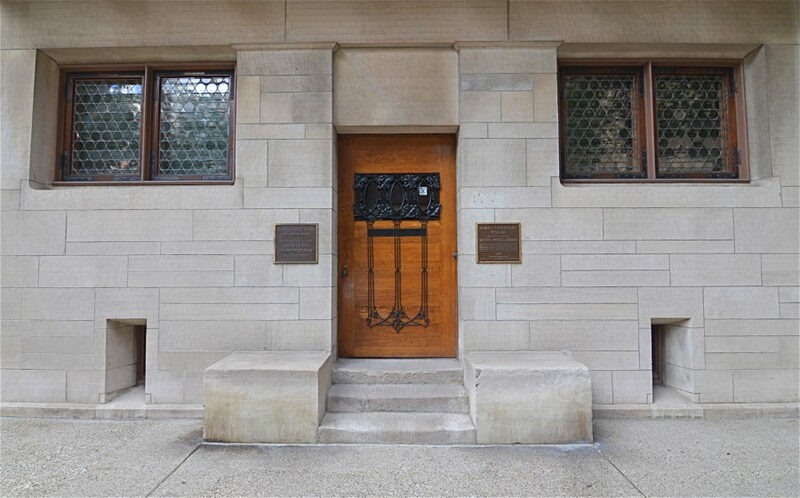 The limestone base surrounds the entrance and alcove windows, which Wright later adopted in his Winslow House design a couple of years later. Although Adler and Sullivan used similar outlined entrances in the St. Louis Mercantile Club (1891) and the Portland Building (1892). Although today the four-story, 4500 sq ft home is surrounded by high rises, it still makes a visual impact to the passerby on the street. One can only imagine what people thought of the building in the late 19th century. The home is assertive and stylish, but at the same time not overly complex or showy. With such an a revolutionary exterior, it is not surprising Adler & Sullivan chose to put in the professional limelight with its publication in Inland Architect and Architectural Record. Over fifty years after its construction, the home’s importance was recognized during a time of urban renewal and development when many significant buildings were being lost. In 1958 the newly formed Commission on Architectural Landmarks designated the home as one of forty buildings that were official city landmarks. 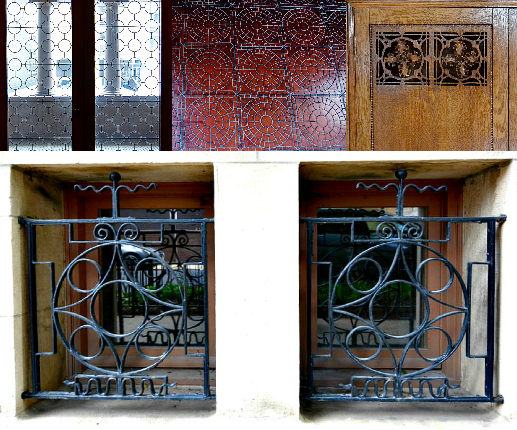 Some historians, while questioning Frank Lloyd Wright as the sole architect of the Charnley House, believe he at least had a hand in some of the ornamentation. The design motifs, specifically the use of the pointed oval, circle-in-a-square, beading and dentil trim, are characteristic of both of Sullivan and Wright’s architectural philosophies at the time. It could be argued that the ornamentation, found on both the exterior and interior of the home, could possibly be a collaboration between the two architects. Sullivan’s ornament, becoming freer and more vibrant throughout the 1880s, reached its maturity by 1890 the year before Charnley was designed. As Columbia University’s Avery Collection testifies, Sullivan never entirely relinquished control over the working drawings for ornamentation. After 1888, Sullivan had a number of capable assistants and draftsmen, yet the final result rarely deviated from his original drawings. Even Wright admitted that the composition and ornamentation of the Getty Tomb (1890) was entirely from Sullivan’s hand, with no influence or alteration coming from any of his assistants. On the other hand no ornament was used in Wright’s designs prior to 1894 (except the Harlan House, built the same year as the Charnley House). An important part of Sullivan’s design process was the pointed oval as it directly related to his idea of the seed pod, a symbol not just of nature’s growth, but also the creative process. The most obvious examples on the exterior are the balcony panels and front door ironwork grille. The circle-in-a-square motif, later used by Wright as a “signature,” might be one of the ornamental designs we can fully attribute to him. There are a few examples in the home that are rigid in some places and do not have the natural fluidity associated with Sullivan. “Circles inside squares,” seen all over the inside of the home, suggests that Wright had more of a hand in designing the interior. Yet like all the motifs, the theme is carried from the inside to outside, specifically in the basement window grilles and leaded glass balcony doors. 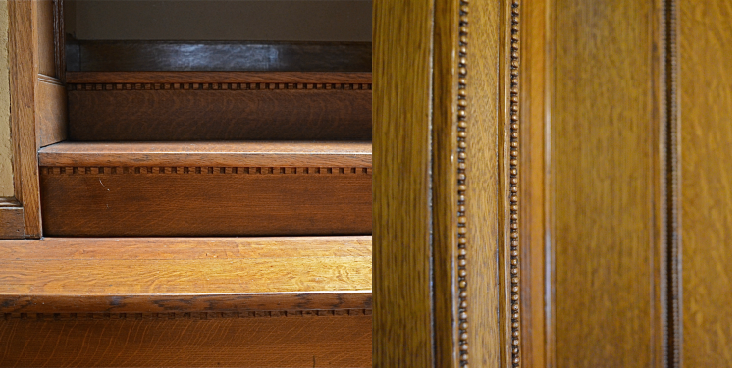 The bead detailing, mass-produced and tacked onto wood trim, was used by both Sullivan and Wright throughout their careers. Even Sullivan’s famous skyscrapers have bead ornamentation. Found on most of the door ware, panels, and moldings of the interior, beading can also be seen in an unexpected place on the outside; specifically the roof cornice. Such attention to detail is amazing, especially when you consider the fact that most people would not even see it all the way up there. The dentil trim is a curious inclusion for such a modern house as the design dates to ancient Greek and Roman architecture. Wright might have chosen it as dentils are found throughout his Oak Park Home & Studio, built just a few years before Charnley. The two buildings share a similarity in that they both have dentil trim underneath the treads of their main staircases. Much like the bead detailing, dentils are also found all over Charnley and even included on the balcony design. In the next installment I will take you inside the Charnley House as well as closely examine Wright’s Winslow House and Sullivan’s Bradley House as well as the architects’ relationship right before Sullivan’s death. Drury, John. Old Chicago Houses. Chicago: University of Chicago Press, 1941. Gebhard, David. 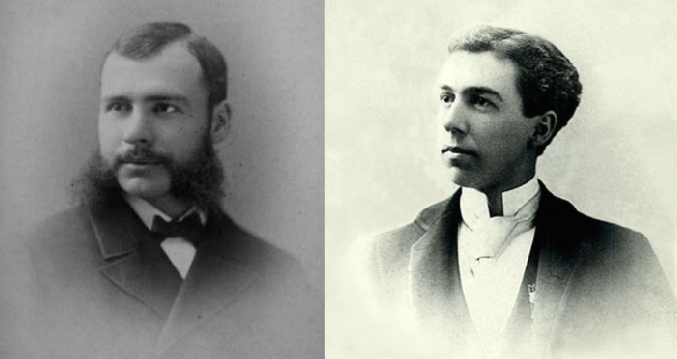 “Louis Sullivan and George Grant Elmslie.” Journal of the Society of Architectural Historians Vol. 19, No. 2 (1960): 62-68. Longstreth, Richard, ed. 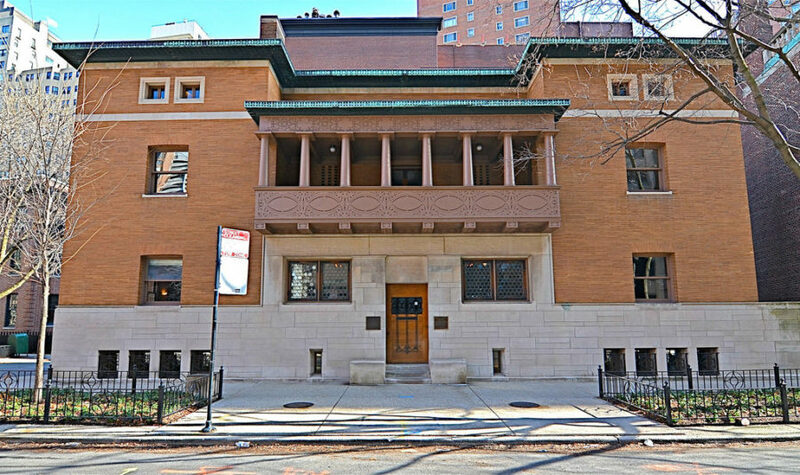 The Charnley House: Louis Sullivan, Frank Lloyd Wright, and the Making of Chicago’s Gold Coast. Chicago: University of Chicago Press, 2005. Menocal, Narciso G. Architecture as Nature: The Transcendentalist Idea of Louis Sullivan. Madison: University of Wisconsin Press, 1981. Nickel, Richard and Aaron Siskind et al. 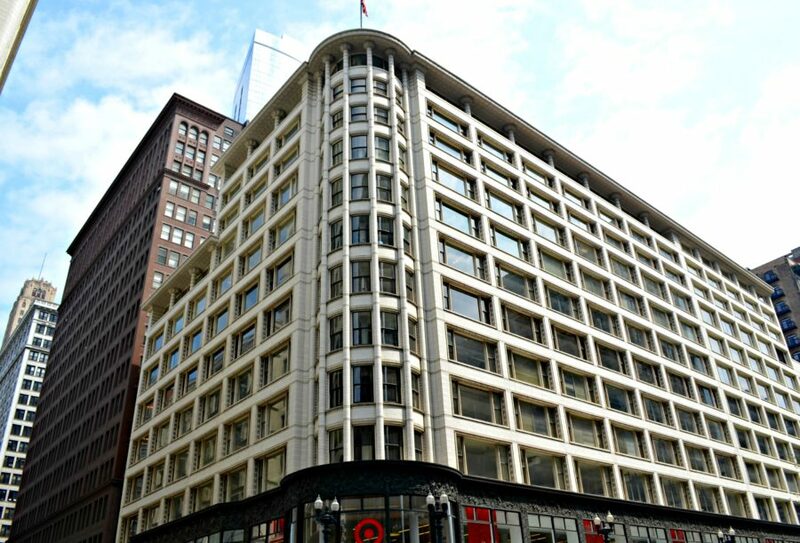 The Complete Architecture of Adler & Sullivan. Chicago: University of Chicago Press, 2010. Osźuścik, Philippe. 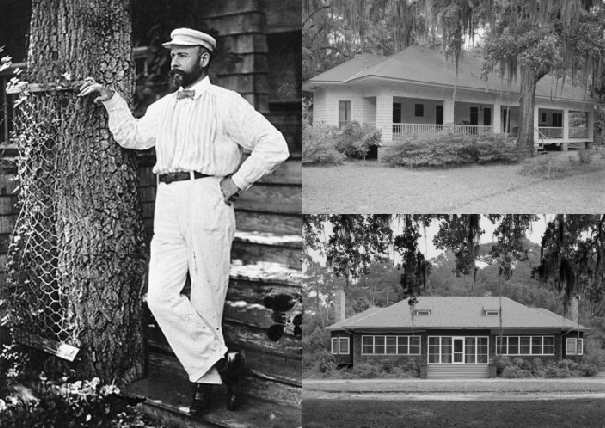 “Louis Sullivan’s Ocean Springs Cottages: A Vernacular Perspective.” Material Culture Vol. 41, No. 2 (2009): 38-56. Wright, Frank Lloyd. Genius and the Mobocracy. New York City: Duell, Sloan, and Pearce, 1949.